Murali Nikam who cannot tell how old he is but speaks in a bold voice that he was rescued along with other 12 children from Kagal Kolhapur where they all were working as caretakers of sheep. 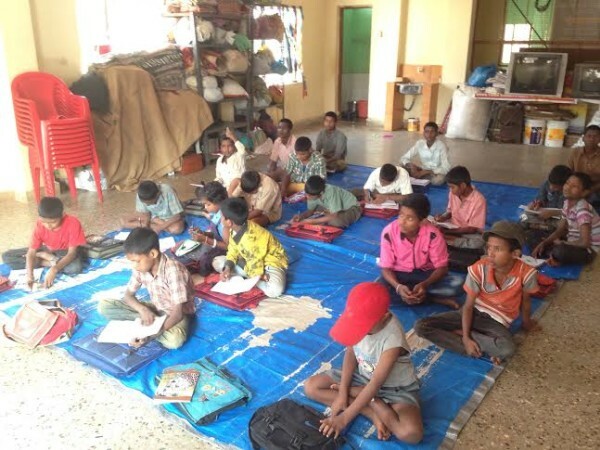 The labour officer from Kolhapur rescued them and sent them to Prajwal Child Labour Rehabilitation Centre in Khade Bazar Shahpur, where they are getting their basic education, food and shelter. Originally from village Savargali from Khanapur taluka and they are tribal’s from the Kaarkari tribe which make their living in the forest by hunting and cutting trees. The village has about 10 families with about 7-8 children in each family. They used to eat anything from roots to leaves to animals and used to hunt with bow and arrows, Murali said. These children did not even have any proof to show their Indian citizens, but now after being in the rehab centre they have got their names enrolled on the Ration card. Currently the Prajwal Child Labour Rehabilitation Centre is occupied by 30 such similar children rescued from various places nearby where they get their food, education and shelter. The Prajwal Child Labour Rehabilitation Centre run by the Prajwal organisation an NGO is taking care of these children but the money the government is giving them is very meager. To add to the hardships, the government has not released funds for the past 5 months. The centre has 3 teachers and a cook. Rajendra Naik, president of Prajwal organist ion who is running the show now has put in his own funds but he is also out of funds now and the future of these kids is in darkness. The centre get govt funds of Rs.800 per student for food/clothing, Rs.200 as medical expenses for 50 children. The rent of the hall is 9000 where as 7000 is reimbursed. Worst part being these meager funds are also not disposed on time. Currently housed with 30 children, the Prajwal Child Labour Rehabilitation Centre at Katwa Memorial Hall, Khade Bazar opposite Ambabai temple, Shahpur Belgaum is looking for generous people who can donate time and funds towards the children who need care and affection. Vijaya Bank, Ramdev Galli Belgaum.